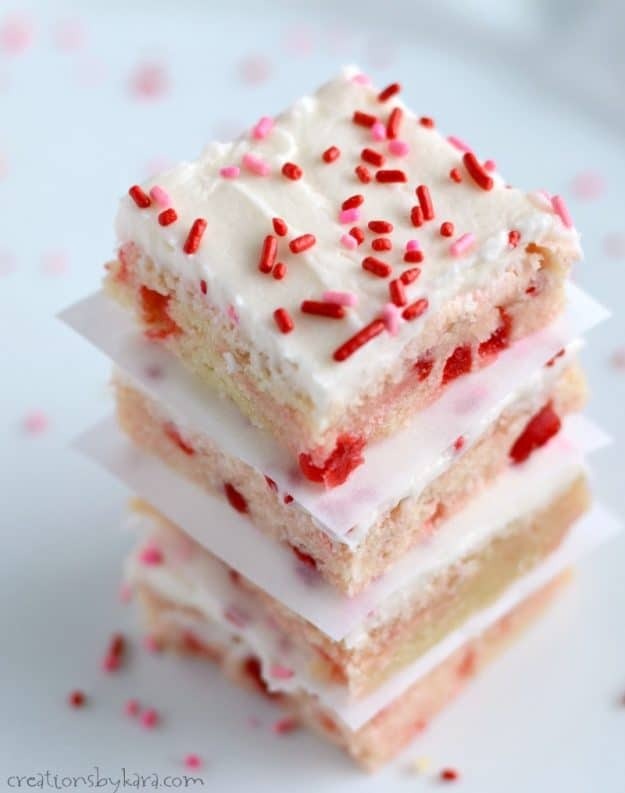 Maraschino Cherry Sugar Cookie Bars . . . these pretty little bars are loaded with juicy cherries. 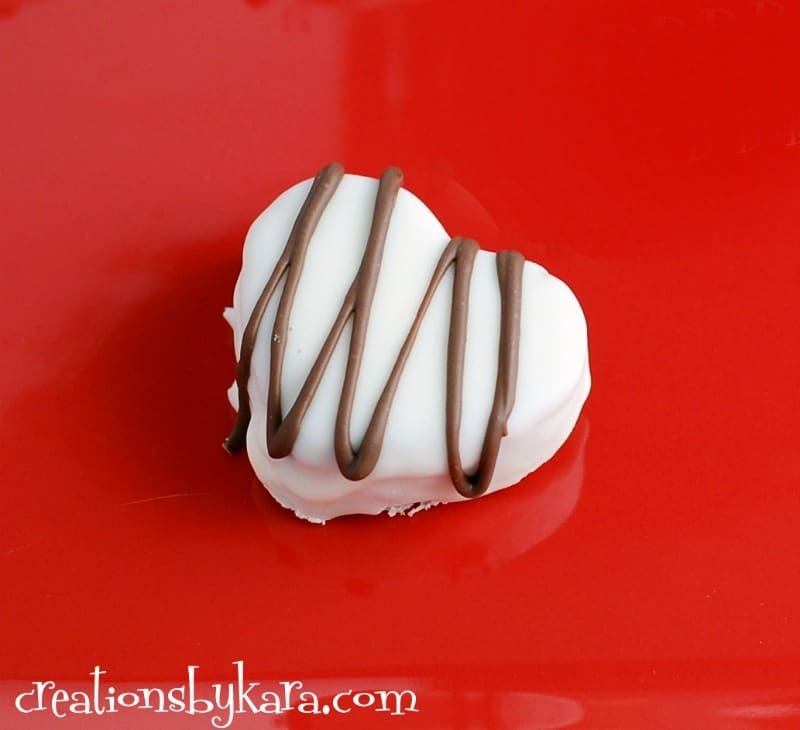 They are perfect for Valentine’s Day! 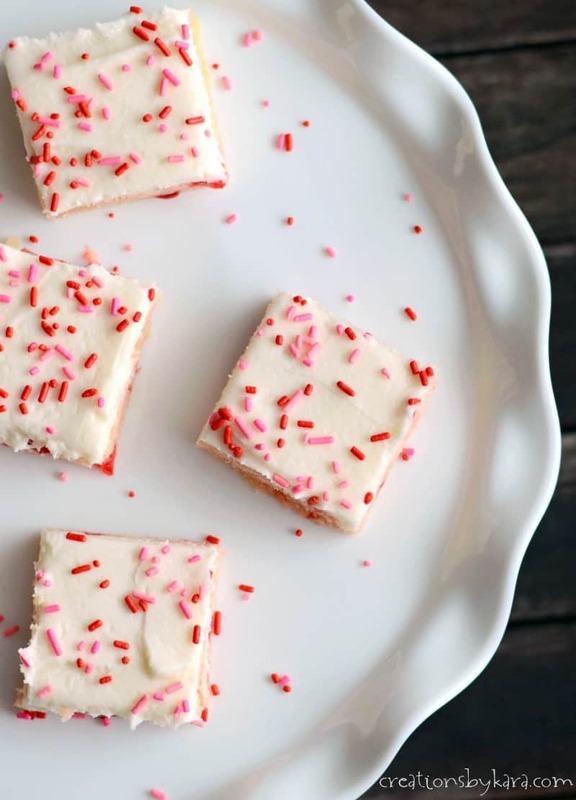 Raise your hand if you love sugar cookie bars. I sure do! You can whip them up in half the time of regular sugar cookies, and they taste just as good. I love serving them because I always get oohs and aahs. 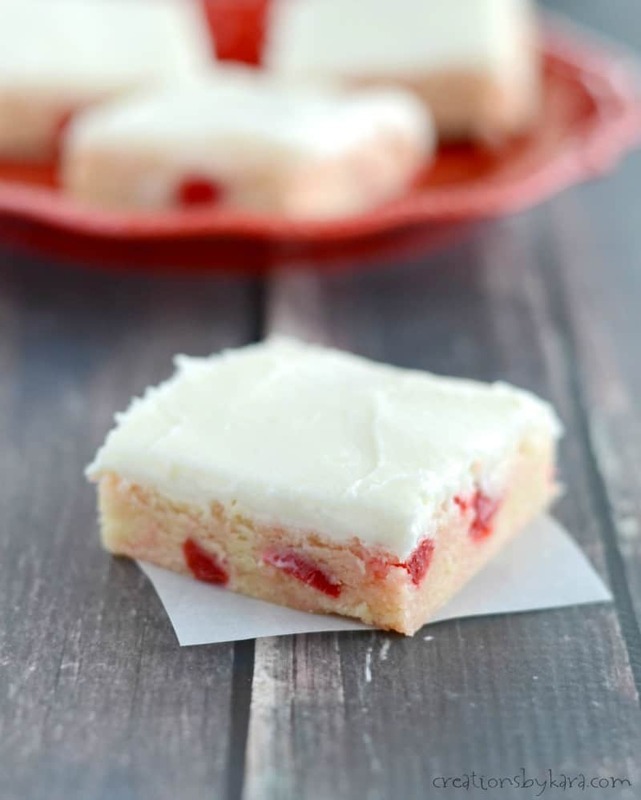 These Maraschino Cherry Sugar Cookie Bars are a new favorite at my house. 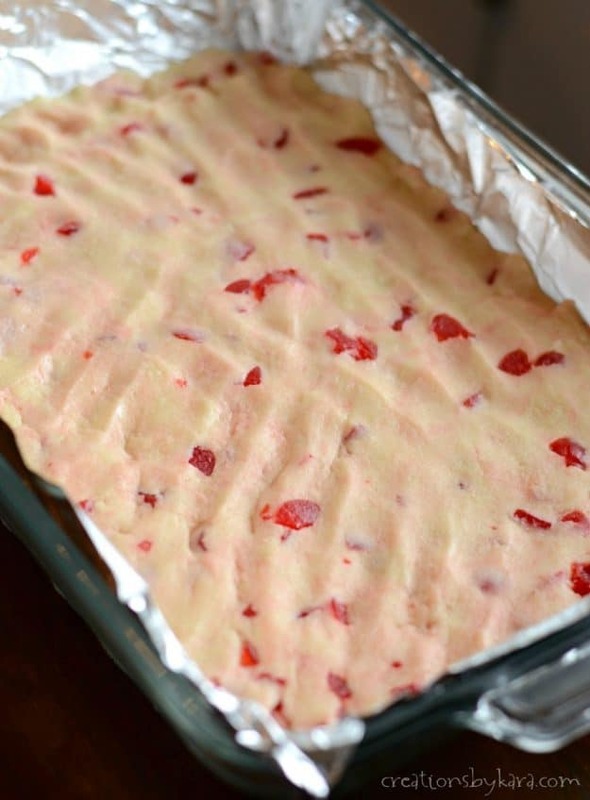 They are similar to my popular sugar cookie bars, but with a cherry twist. Absolutely scrumptious! Aren’t they pretty with those juicy cherries peeking out? Trust me, they taste as good as they look. Adding pink and red sprinkles to the top of the cream cheese frosting makes these bars extra special for Valentine’s Day, but they are just as tasty without them. 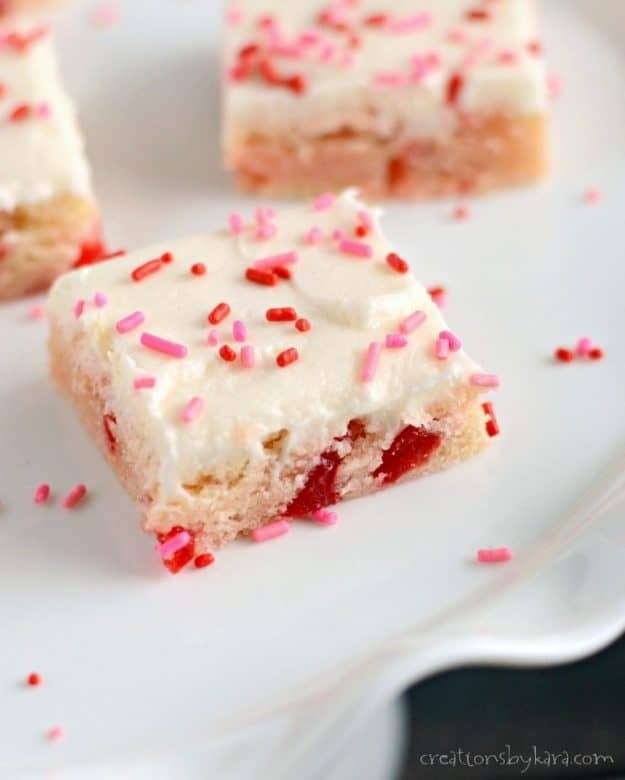 These cherry sugar cookie bars are so simple. 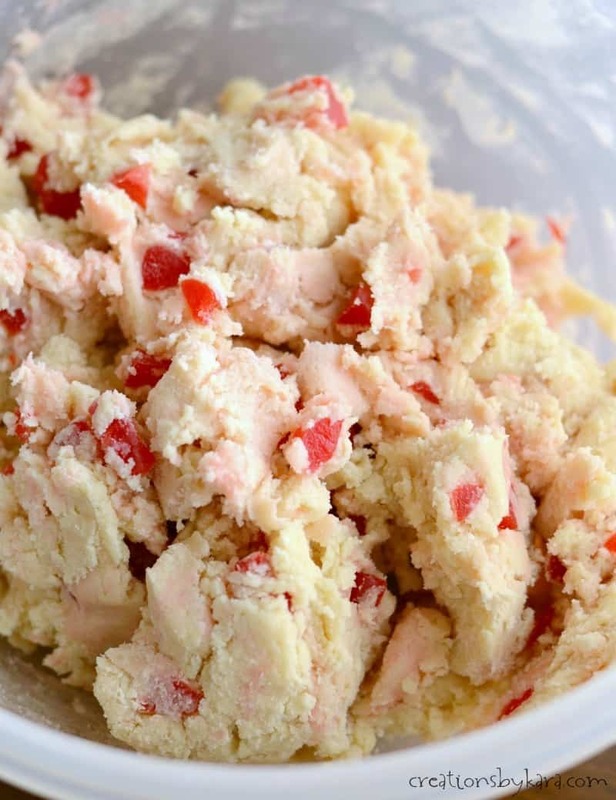 You start with a basic cookie dough, then add cherries and some almond extract. The almond extract is a perfect compliment to the cherries, and makes them extra yummy! You will end up with a stiff dough, but just press firmly till it is evenly spread in the bottom of the pan. I like to get my hands wet so the dough doesn’t stick to them as easily. These bars are actually pretty tasty as is, but spreading a creamy layer of cream cheese frosting on top makes them downright irresistible! 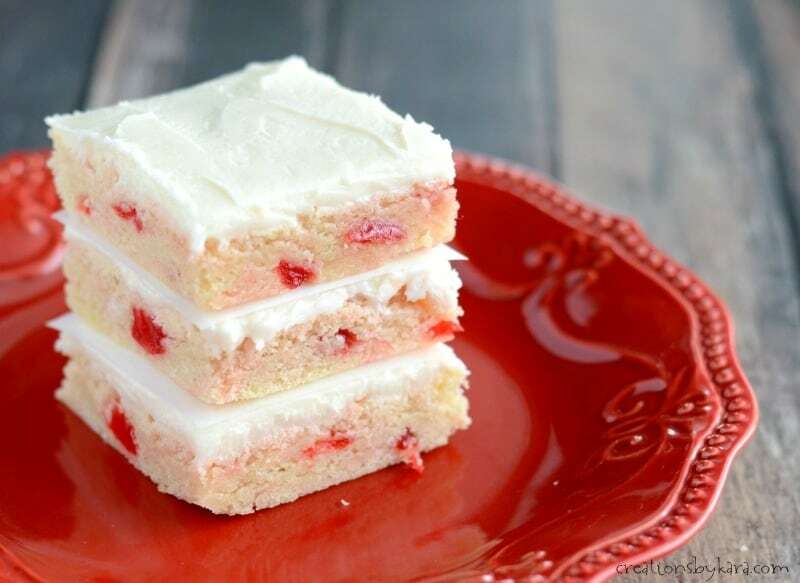 Sugar cookie bars loaded with maraschino cherries and topped with cream cheese frosting. For bars: Drain cherries well. Chop and set aside. Cream butter and sugar in a mixing bowl. Beat in the eggs, vanilla, and almond extract. Add flour, salt, and baking powder. Stir till combined. Fold in the cherries. Press dough into a well greased 9x13" pan. (I like to line mine with foil first.) Bake at 350° for about 20 minutes or till very lightly brown on the edges. Cool bars completely, then frost with cream cheese frosting. 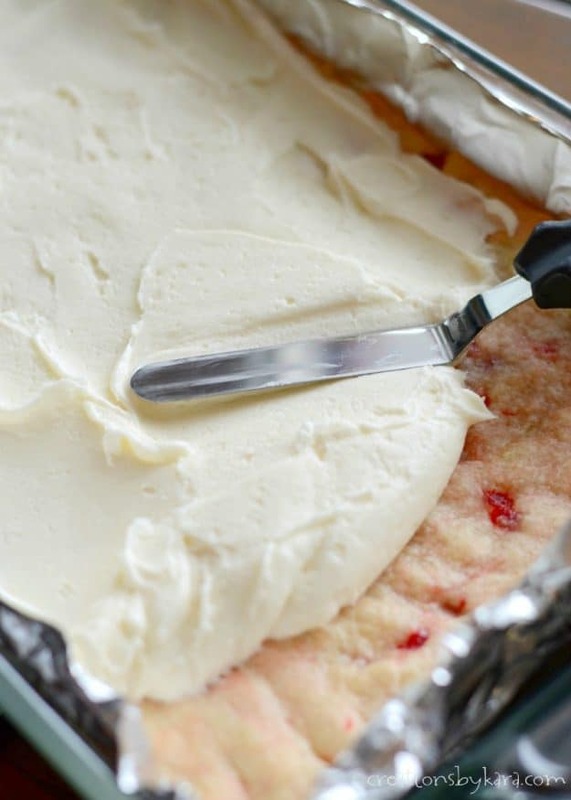 Frosting: Beat cream cheese and butter till smooth and creamy. Beat in vanilla, almond extract, salt, and enough powdered sugar to make a spreadable frosting. Spread on bars. And for more recipes perfect for Valentine’s Day, check out these posts! For all Valentine’s ideas, go HERE. For all desserts, go HERE. 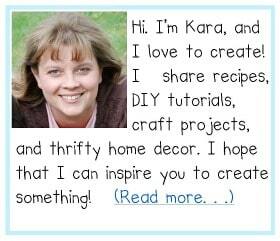 Don’t miss a thing – Sign up for the Creations by Kara Newsletter today! This is such a fabulous treat! I would love to give it a try! I am loving these! 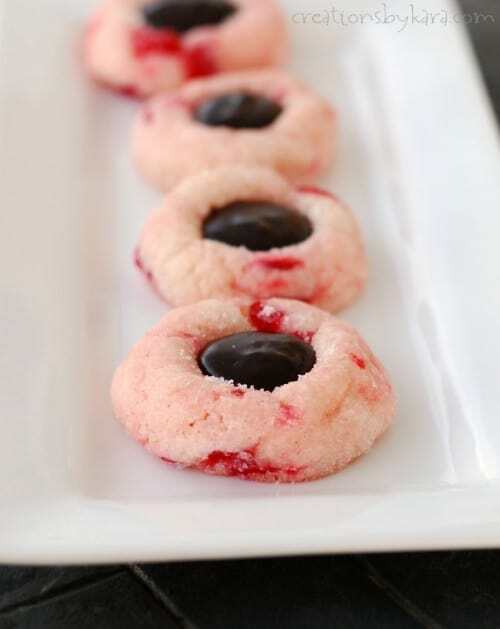 Adding maraschino cherries is such a great idea and really puts these over the top. I love making sugar cookie bars but I’ve never tried them with maraschino cherries. Sounds yummy and perfect for the holidays! These are so perfect for Christmas! 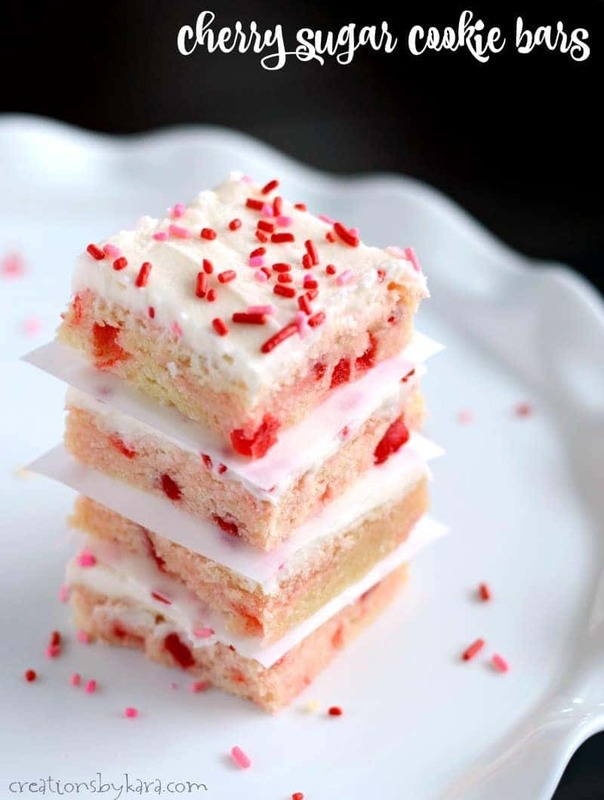 It’s so hard to find a red and white recipe that’s not peppermint. YUM! These are so cute Kara! What beautiful treats, which of course make me think of homemade gifts! What a great recipe! 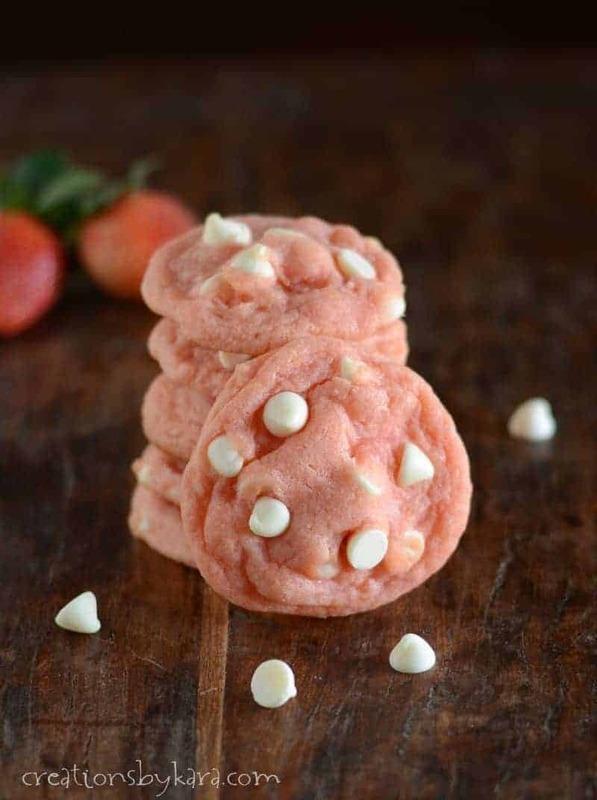 This looks perfect for holiday parties — and my kids would adore them! !